Babel and its towers is covered in roses: with Kifsgate, New Dawn and Mme Alfred Carrière flowering on the roofs of wooden pyramids at the path junctions in the Babylonstoren gardens. 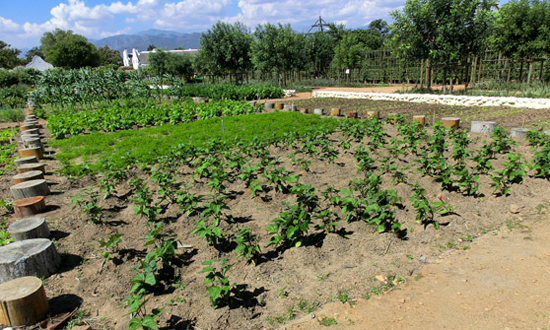 The potagers offer beetroot, salad leaves, carrots, aubergines and other vegetables for the restaurant, and potatoes and sweet potatoes are also being grown. A little reminder: everything grows very quickly. To harvest radishes, for example, expect just 7 days between the sowing and the plate! Other highlights include a wild shaded walkway along the stream allows one to walk amongst the hundreds of Clivias, unfortunately not currently in flower. The size of the garden and its diversity, what there is to learn about the techniques used, easily requires a full day visit and one can return many times. 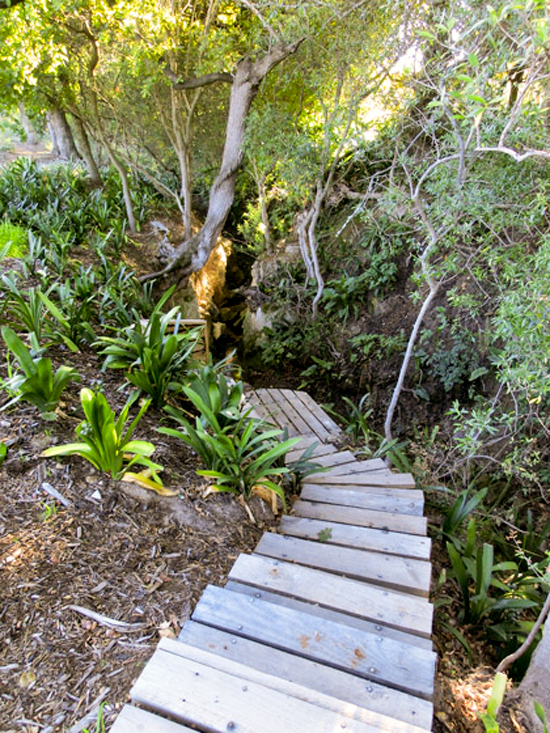 Wooden walk-way amongst the clivias. 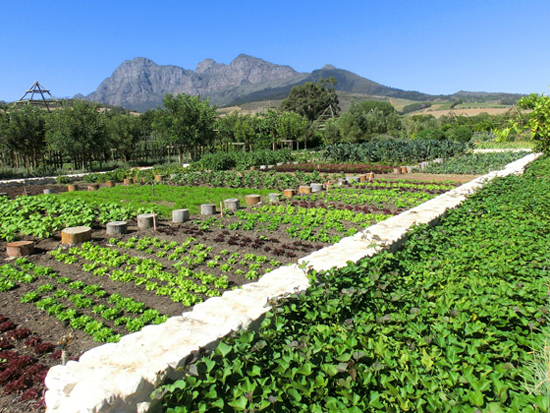 So, with Liesl and her team of 15 gardeners, what joy and lessons I lived through in the few days I spent at their side. Because, while the garden and gardening is important and the main object, the human contact and cultural exchange is also vital. So thank you to Liesl, Lara, Adriaan, Sive, Peter, Donavan, Wendel (and all the others) for their welcome, their kindness, the sharing of their daily lives and their joy of living (joie de vivre! ).